Using someone’s name creates a more powerful people skills connection than saying sir or ma’am. On workplace teams, between leaders and employees, in sales, and in customer service, use names to build better relationships. There are times when formality is appropriate. Yet you can show respect by using a title and surname (e.g. Ms./Mr.) and have a positive people skills connection and relationship. Powerful people skills connection starts with a name. Image by Betsy Weber via Flickr Creative Commons License. Image by Betsy Weber via Flickr Creative Commons License. People use their name to identify themselves. Honor their identity for a powerful people skills connection. A person’s name says they are part of the human race. Let people know you see them as humans. Conversely, when people want to disrespect someone they stop using that person’s name. Relationship building hinges on names. Can you imagine having a true relationship with people without knowing their names? “Hey you …” doesn’t cut it! New insight on addressing a customer with their name – 1 min video. Use the customer’s name. Moreover, don’t switch from using the customer’s name in your greeting to using ma’am or sir the rest of the time. You come across as detached, indifferent, and disinterested. Connect with customers to show them you care about them and their needs. They will have the comfort, interest, and trust to come back for more. Except in specific situations like the military that require sir/ma’am or other situations that require titles (Madam/Mr. President), use people’s names or surnames (Dr./Ms./Mr. ___) to create a powerful people skills connection. You won’t regret it. How do you feel when someone addresses you with your name? Great tip, Kate! The powerful connection you advocate is why I insist on name tags or tent cards for all my training and facilitation projects. It’s easier and more effective to establish a common bond when we work together – whether for a few hours or a few days. I love your new book and am recommending it to my colleagues and clients. Thanks for sharing your wisdom! Honored thx Sybil .. so glad you found this post and my book, Leading Morale, valuable. On the topic of knowing and using people’s names, it’s amazing how many people I see overlooking this basic yet powerful step. Let’s keep the message going! It’s interesting, at my children’s school the kids called the teacher Miss or Mister for years. Miss said this. Mister taught us this. When the new headmaster came, he created a new rule that you call them Miss [Last Name] and Mr. [Last Name]. I’ll bet that despite how it’s worked for a long time, your insights here are a part of the change. I LOVE this Alli. Small everyday actions create positive change. Great post Kate! Names are so important in helping cultivate meaningful relationships. All your points are right on target because without specific ways to call someone it is impossible to build a connection. When I run my workshops I try to learn each person’s name as quickly as possible. I notice a huge difference in their responses and connection to the program when I make it feel more personal. 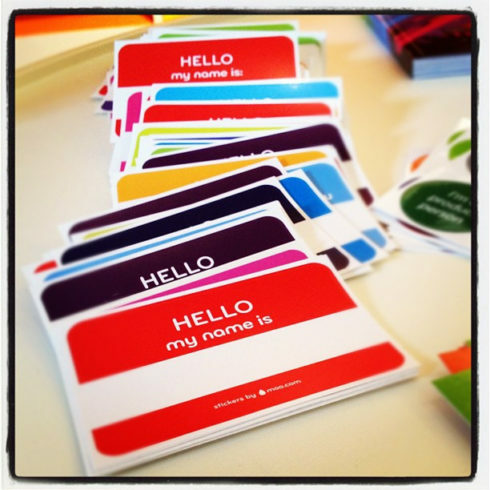 Love your illustration Teri about learning people’s names quickly in a work setting. The personal connection is more than a nicety. It creates team results faster than ever.